Rivergate Place, Murarrie, QLD 4172, Australia. Rivergate marina has 105 berths up to 80 metres in length with 24-hour security services and deep water access on any tide. The Shipyard includes a 12,000sqm hardstand, 75 and 300 tonne travelifts, with 600 tonne capabilities available, and 320 approved contractors in over 20 trades. Rivergate is an official customs and clearance port in South East Queensland, and is acknowledge as one of Australia’s premier superyacht refit facilities. 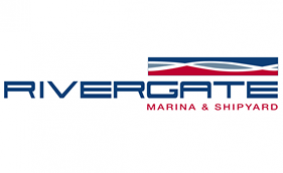 Rivergate is a great location for vessels of all shapes and sizes to complete refits, maintenance work and repairs in a pristine shipyard and marina complex, with a dedicated project management team to assist with all works. Services available within the Shipyard include marine electricians and electrical engineers; shipwrights and cabinet makers; marine engineers; propulsion experts; composite material repairers; a range of service agents for all marine engines, plant and equipment; marine carpeting; upholsterers and painters and quality refinishes.